Go GREEN and Use NO ELECTRICITY! If you ever need to change the NI-MH battery, just unscrew the lens cover screws to access the battery panel on the underside of the Solar Module. No need to remove the base from your installation. Feel confident that you can install our solar lights permanently in concrete, among pavers in your driveway or walkway or as part of your landscaping, knowing that your lights will not become obsolete. Superb winter performance with a Non-Slip Surface on the lens. Can be installed in Poured Concrete or other vertical or horizontal masonary applications as long as the lens receives sunlight. Full 90 Day Manufacturer's Warranty against operational defects but should last for many years. Don't be confused by copycats. Our fixtures are made to independently support the weight of a car (see video below) and have a longer warranty! Note: NiMH stands for Nickel-Metal Hydride, the materials used in our battery. Unlike NiCad batteries, NiMH batteries do not use heavy metals that may have toxic effects. In addition, they can store up to 50% more power than NiCad batteries and do not suffer from memory effects. That is why our lights stay on longer! Each box contains one (1) 4” x 8” solar brick landscape light. The light is comprised of a lens, solar module, and a base. The solar light module contains (12) ultrabright cool white LEDs and three solar panels on the top. On the underside of the solar light module is the battery compartment and the light switch. When you receive your Solar Brick Landscape Light, it comes with the light switched in the “OFF” position. (You can turn the switch off by removing the lens cover and pressing the Power Switch once until you hear a “click”. Your Solar Brick Landscape Light can be installed permanently in concrete, imbedded within your brick pavers, lining the driveway, sidewalk, patio, pool deck or placed wherever decorative landscape lighting is desired. Make sure to install them where they have full access to the sun most of the day. Your Solar Brick Landscape Light should illuminate for up to 10+ hours in the spring and summer months and somewhat less in the fall and winter. Your Solar Brick Landscape Light will automatically turn on at night when the sun goes down and shut off when the sun comes up or when the battery as been fully discharged. During the daylight hours, the solar panels convert the sun’s energy into electricity and charges the 1.2 Volt AAA 1,000 mAh NIMH battery. Your rechargeable NI-MH AAA battery should last for up to four to five years. When it comes time to replace the battery, simply come back to www.ShopTJB.com and purchase a replacement 1,000 mAh NI-MH battery. It is important that when you reassemble the light to ensure the gasket is smoothed down completely to be flush with the raised lip on the inside of the light base. Tighten the screws firmly to make certain that the solar light is sealed properly DO NOT OVER TIGHTEN. (It will warp the lens and water can seep into the solar light and can damage the electronic components). Remove the lens cover by unscrewing the ten screws with the included allen wrench. Remove the lense and rubber gasket and set them aside. Then grasp the solar light module by the two tabs protruding from the sides and pull up to remove the unit. Turn the solar light module upside down and unscrew the six small screws covering the battery compartment. Then replace the battery with a new AA NI-MH. Reverse the procedure to seal everything back up. Tighten the screws firmly; be sure not to over tighten and strip the screws. You can use the same procedure to replace the solar light module if you desire to change the LED light color or if the module becomes inoperable after many years of use. If ­you have a yard and have ever thought about lighting it at night, then you have probably heard about solar yard lights. As long as a location gets direct sunlight, you can put a light there and have light at night for several hrs. These­ lights are extremely interesting because they are almost like mini-satellites. They generate and store their own power during the day and then release it at night. This is just like a satellite that stores solar energy while it is on the sunny side of the planet and then uses that energy when it's on the dark side. A solar yard light uses standard solar cells in a very straightforward application. A single solar cell produces a maximum of 0.45 volts and a varying amount of current depending on the size of the cell and the amount of light striking the surface. In a typical yard light, therefore, you need 6 cells wired in series. In this yard light, the six cells will produce 2.5 volts and a maximum of about 350 milliamps in full, bright sunlight. The solar cells are wired directly to the battery through a diode (which prevents the battery's current from flowing back through the solar cell at night). The battery is a high powered AA NI-MH battery. A battery like this produces about 1.2 volts and can store a maximum of approximately 1000 milliamp-hours. During the day, the battery charges, reaching maximum charge except on shorter winter days or days when there is heavy overcast. At night, the solar cells stop producing power. The photo resistor turns on the LED. The controller board accepts power from the solar cell and battery, as well as input from the photo resistor. It has a three-transistor circuit that turns on the LED when the photo resistor indicates darkness. LEDs draw about 45 milliamps with the battery producing about 1.23 volts (0.055 watts). It produces about half of the light that a candle would. The NI-MH battery, when fully charged, can operate the LED for about up to 10hrs on this 4" x 8" light. Half of a candle's light is not very much, and if you have ever purchased one of these yard lights you know that it really is not enough to provide illumination. You use them more for marking a trail or pathway -- they are bright enough to see, but not really bright enough to illuminate the ground to any great degree. They help define borders, pathways, & stairways. Use them in walkways, patios, driveways, pool deck, stairways & along garden paths. Due to the lower output, bugs are not as attracted to them as they are to other outdoor lighting. In late Spring, Summer and early Autumn the Solar Paver lights will fully charge on most days giving them enough charge to light for up to 12 hours. In winter the Solar Paver lights will charge up enough to light for up to 6 hours on all but the most unfavourable of winter weather days unless covered by snow. The Solar Paver lights are IP67 rated making it our most waterproof light. 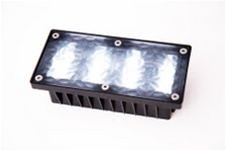 IP67 means the Solar Paver lights are protected against dust - No ingress of dust; complete protection against contact and ingress of water in harmful quantity shall not be possible when the enclosure is immersed in water under defined conditions of pressure and time (up to 3' / 1 m of submersion). Installation Tip: In areas that experience freeze thaw cycles during the winter months, we have found a neat way to secure the lights into your installation. Before installing the Solar Paver Light into your pavers, spray a little expanding foam (Great Stuff, Black Waterfall Foam, Etc.) into the space where the fixture will be installed. Then put the fixture into the space. The expanding foam will fill any void spaces and will adhere the fixture to all adjoining pavers. You must put some weight on top of the fixture as the expanding foam dries so that the foam does not push the fixture out of the space. Once the foam has dried, remove the weight. If any foam came up between the fixture and adjioning pavers, allow the foam to dry and cut off any extra with a knife. (Next time use less foam!). From John Rooks of Southfield, Minnesota on 10/23/2017 . From Sam Kiltonson of Nashville, Tennessee on 10/12/2017 . From Susan Horton of Overland Park, Kansas on 10/1/2017 . From Linda Burret of Monroe, Louisiana on 9/26/2017 . From Bill P of Cheshire, Connecticut on 9/10/2017 . 4/8/2018 – Are there color options for the Solar Brick Pavers. 10/2/2017 – Are there other sizes than 4" x 8" available? 9/27/2017 – Can I get replacement parts if needed? 9/16/2017 – Is the unit strong enough so I can park my car on top of the lights? 7/27/2017 – So you ship outside USA? 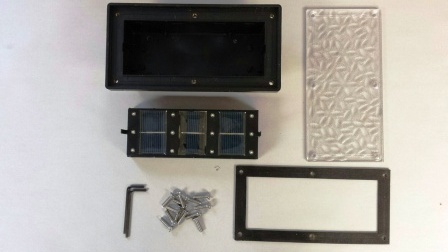 Replacement Parts for our 4 inch x 8 inch Solar Brick Paver Landscape Lights – All the parts you need to get your light back in working order.